Our design team prepare unique costume or dress design for you – based on your detailed description, ideas and even photos of your figure, your existing fabrics! Afterwards we need 7-10 days to work out your unique Own Costume Design. Costume design just for you! Costume designs for: Singers, Latin, Standard & Ballroom Dancers, Belly Dancers, Skating Dresses, Magician costumes, Magician assistant costumes, Circus Costumes for aerial artists, acrobats, jugglers, hula-hoop, contortionists, equilibrists, etc…. Fill in the Own Costume Design form to let us know the most details of your dream costume. If you have fabrics already, please send us a photo of the fabrics and patterns attached to the questionnaire. When you are ready with the form, type in your e-mail address and click on Submit. Within 48 hours we will get in touch with you with the request for the costume designing payment and discuss your costume design idea. After succesful payment our team will start to designing your dream costume. 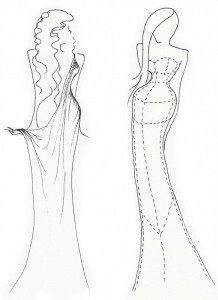 We make costume design sketches for you and you get the sketches by e-mail. Send us your additional feedback and suggestions. We prepare the detailed plan for you for the choosen variant in 2-3 days. Kindly we ask you to fill in the form below. The more details you describe for us, the better the design would suits you and your performance. If you have any comments or questions, please feel free to contact us! Please specify your preferences for all the dress elements below! Colours - specify your preferences!